Its was created to rip you off by pretending to offer services not available on the real site. What is Edmunds-VPP? The Edmunds Vehicle Purchase Protection (VPP) program provides protection of up to US$100,000 against certain losses associated with some types of fraud. You are automatically enrolled in the program at no charge when you complete the purchase of an vehicle on the Edmunds-VPP site. Should you have further questions or need additional information do not hesitate to contact us. You can check GENERAL PROVISIONS for more information. 1. The Buyer and the Seller agree on the transaction terms and the selling price. The Seller contacts Edmunds-VPP and provides the transaction details. 2. Edmunds-VPP accepts the transaction and offers purchase protection to the Buyer (if the transaction is declined, no further action is required from the Buyer or the Seller). 3. The Buyer receives an invoice and submit the payment to Edmunds-VPP. 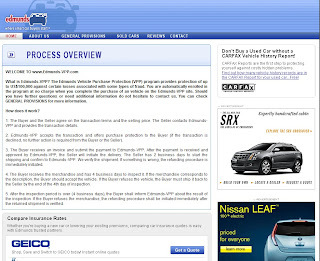 After the payment is received and approved by Edmunds-VPP, the Seller will initiate the delivery. The Seller has 2 business days to start the shipping and confirm to Edmunds-VPP. We verify the shipment. If something is wrong, the refunding procedure is immediately initiated. 4. The Buyer receives the merchandise and has 4 business days to inspect it. If the merchandise corresponds to the description, the Buyer should accept the vehicle. If the Buyer refuses the vehicle, the Buyer must ship it back to the Seller by the end of the 4th day of inspection. 5. After the inspection period is over (4 business days), the Buyer shall inform Edmunds-VPP about the result of the inspection. If the Buyer refuses the merchandise, the refunding procedure shall be initiated immediately after the returned shipment is verified. With 84,654 processed transactions and more than 8,000 executed each year, Edmunds Autos is one of the most popular sale program in the world. 1. The Buyer and the Seller agree on the transaction terms and the selling price. The Seller contacts Edmunds Autos and provides the transaction details. 2. Edmunds Autos accepts the transaction and offers purchase protection to the Buyer (if the transaction is declined, no further action is required from the Buyer or the Seller). 3. The Buyer receives an invoice and submit the payment to Edmunds Autos. After the payment is received and approved by Edmunds Autos, the Seller will initiate the delivery. The Seller has 2 business days to start the shipping and confirm to Edmunds Autos. We verify the shipment. If something is wrong, the refunding procedure is immediately initiated. 5. After the inspection period is over (4 business days), the Buyer shall inform Edmunds Autos about the result of the inspection. If the Buyer refuses the merchandise, the refunding procedure shall be initiated immediately after the returned shipment is verified.